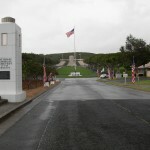 No straight road leads to the National Memorial Cemetery of the Pacific in Honolulu. Winding up the narrow streets past modest houses and bright splashes of bougainvillea you only know that if you are still ascending your destination is surely ahead. At the top the Punchbowl opens up wide, a cemetery like no other, dedicated to those who lost their lives in World War II in the Pacific and the Korean and Vietnam Conflicts. 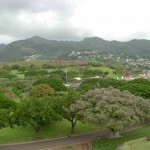 Puowaina Crater, once the site of royal Hawaiian burials and sacrifices, is now the final resting place of tens of thousands of American war dead, and the towering Honolulu Memorial honors over 28,000 MIA (missing in action). The meticulously kept grounds, graceful tree-lined avenues, and the sweeping vistas provide a powerful space to honor the fallen and to keep our national memory alive. The Wake Island mass grave lies in Section G of the cemetery, just off the inner drive. The large plaque names 178 men who lost their lives on Wake in World War II. In 1947, the 604th Graves Registration Unit removed the known graves on Wake Island and brought the remains to Oahu. 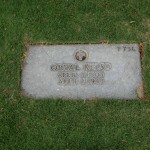 They were interred with honors in the Punchbowl Cemetery in 1953. Group Burial No. 4568, GB-71, contains the recovered remains, though most of them were never positively identified. For me and many in the Wake Family, this grave is the heart of the cemetery. With the discovery of additional remains on Wake Island in 2011, the Joint POW-MIA Accounting Command opened an investigation. I am aiding JPAC in the search for family members of the civilians who died on Wake, including the last 98 who were massacred in October 1943, to provide mitochondrial DNA samples in an attempt to identify the remains. Please see my November 2012 post on the JPAC Mission. The names on the mass grave plaque in Punchbowl Cemetery include 47 military (44 USMC and 3 USN) and 131 civilians. Missing from the list of military names are those of Captain Henry T. Elrod and Lieutenant Carl Davidson (and possibly a Corporal Doyle or Boyle). “Hammerin’ Hank” Elrod, posthumously awarded the Medal of Honor, rests in Arlington National Cemetery. Lieutenant Davidson’s Wildcat was shot down at sea during a fierce air battle over Wake and his remains were not recovered. The 131 civilian names on the Wake Island mass grave initially appeared to me to contain some discrepancies. 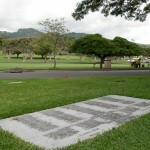 While it was immediately clear that only American war dead were honored here (thus the absence of ten Guamanian employees of Pan American Airways who lost their lives on December 8, 1941, on Wake and whose remains are not otherwise accounted for), four civilian names were missing from the plaque. Additionally, one name appeared to be an error: William (Bill) Charters in fact had lived a long, full life in Idaho after the war and was an active member of the ex-POW survivors organization. Coincidentally I had been contacted by someone looking for information on a family member by the name of Charters who had died on Wake during December 1941, but I could find no record of a second civilian employee or casualty by that name. The mystery was solved when we found that the man had used an alias on Wake (William McGallister), but postwar burial records, confirmed by relatives in the 1950s, were under the Charters name. 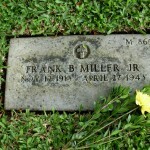 It did not take long to find that the three remaining deceased American civilians were buried elsewhere in the cemetery. George Gibbons and Ralph Higdon, both killed in the Battle of Wake Island on December 23, 1941, and William Miles, who had died of natural causes while a prisoner on Wake in July 1942, had been identified and interred separately. 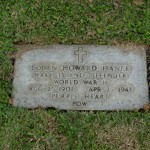 I knew of two other individual graves of Wake men who had died as POWs and were buried in the Punchbowl cemetery and I suspected there might be others. Searching the burial database I located an additional 28 graves of Wake civilians scattered among the thousands of rows in the Punchbowl. I visited each one, swept dried leaves and grass from the stones, and paid my respects. For these men and the fellows whose names are chiseled on the Wake mass grave and tens of thousands of others, there was no straight road to the National Memorial Cemetery of the Pacific. What a tragedy that I did know about the Wake burial site as I have been here twice to walk around and once via a tour bus. This is truly a very beautiful National Cemetery with many beautiful flowers. Thanks Bonnie fo this information and I may have to make another trip to Oahu.